Slow speech equals flat and expressionless? "Sophie est une adolescente. Elle a seize ans et vit avec ses parents, son frère et ses deux chats dans un grand appartement en centre-ville. Sophie est une jeune fille sociable, drôle et gentille. Aujourd'hui, elle retrouve ses amis d'école. Ensemble, ils vont passer l'après-midi à la fête foraine. La jeune fille espère s'amuser." Never forget the vocabulary again: vocabulary recap at the end of the book and each chapter. Variety of situations: 15 stories about emotions, sports, town and buildings, holidays, restaurant, illness, frequency and memories, description, cinema, hotel, at work, phone call, show and performance, school. Lessons, love, and friendship diverse grammar structure and vocab: A good mix of dialogue and description. Improve your reading comprehension for newspaper articles, but also French spoken in the street. Practice your pronunciation and your listening! Talk about being educational and fun at the same time. I seriously cannot believe that French seemed so hard in High School. 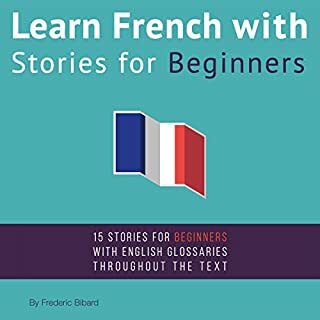 This audio book made learning French as easy as ABC. The stories covered almost all of my normal conversations and the vocabulary recap made it so easy to remember. I've listened to it like two times already!! Super book! 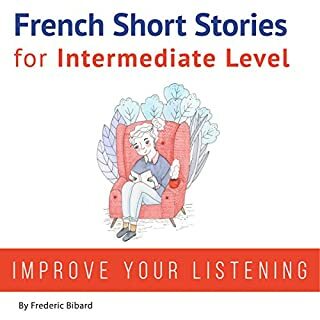 What made the experience of listening to Learn French with Stories for Beginners, Volume 2 the most enjoyable? It is really useful to have an english breaking down for each paragraph and you can hear with cristal clear detail the pronunctiation of each word .As a native spanish speaking person is really tricky to learn french because of the variations from the vocabulary. Making a bridge sing english as a more direct language for understanding makes it really straight forward. Frederic Bilbard. He really makes the stories easy to understand in french, not even a dictionary was necessary for that. What does Frederic Bibard and Adam McVay bring to the story that you wouldn’t experience if you just read the book? Is a really good combination, you can understand everything in detail hitting the rewind button a really short amount of times. Is an audiobook for language not a novel so there was no particularly emotional moment there. This book has been a great way to expand my French vocabulary through immersing myself in the language in a way that can normally only be achieved by visiting the country. I hadn’t studied French since school and this was a great refresher for reminding me of words I already knew as well as helping me to learn new words. The only thing I would say is that as a beginner it is hard to gage the meaning of the stories being read, and as the translations are given to you at the end of each section you never really get a good sense of what is happening. Potentially using the other resources provided would be helpful but at that point you are putting in so much time and effort that you may as well do a course in the language. However having said this, for people with a basic preexisting knowledge of French this is an excellent tool to help improve conversational skills and broaden your vocabulary. 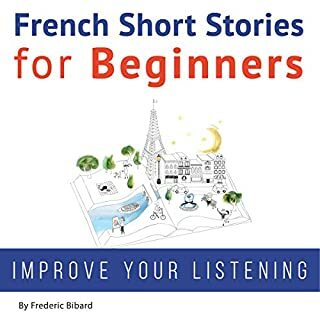 Would you consider the audio edition of Learn French with Stories for Beginners, Volume 2 to be better than the print version? In my opinion both were very instrumental in helping myself progress forward in learning French. It definitely helped listening to the pronunciation. 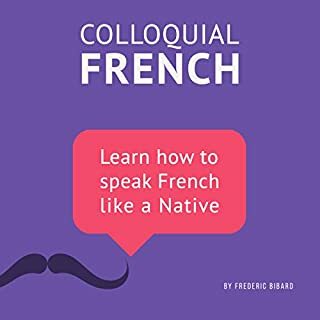 This audible book is very helpful for beginners with the French language. I myself am a beginner, but I studied Spanish all throughout high school and some of college. Studying languages could be very complicated at times, but what I found most helpful in learning a language is using the language as much as possible in a casual/natural manner. In this case learning the language through hearing some of these stories was very helpful. It helped me understand the language in a more casual setting which is a very efficient way of learning in my opinion. The French to English translations of key words at the end of each story was very helpful as well. It helped me learn key words, while demonstrating the correct pronunciation. 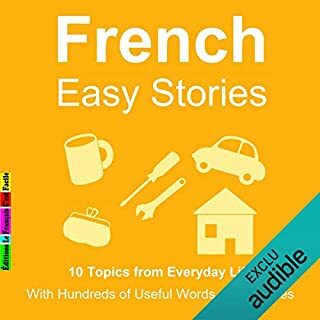 This is a very useful audio book for people who want to learn more French vocab/phrases, and eventually apply it in face to face conversations. "Last year I traveled to Paris. I had a basic knowledge of french learned in high school. Being there I realized how important is to learn to pronunciate correctly in order to communicate on a daily basis. Since I came back I've been searching for a way to learn more but until now I've only found books that felt very boring and were meant for beginners. This book is the perfect combination of pronunciation and grammar. To be able to hear the words and to see it in paper at the same time is a great way to learn every aspect of a lenguaje. You can also hear the audio portion any time, when your doing other things, to assimilate the sounds easily. Through the stories we have access to knowledge in a fresh and fun way. They are very entretaining and help you think every word placed in context. The larger vocabulary recaps at the end and the repetition of words interlaced with their English equivalent helps a lot to reaffirm their meaning and to remember it. After a few listens I felt much more confident whit my french and really eager to hear more. Completely recommended!" 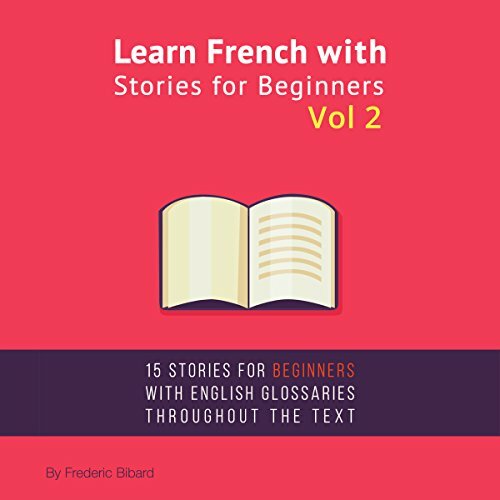 Would you listen to Learn French with Stories for Beginners, Volume 2 again? Why? Sure, it is a great and fun way to expand the vocabulary. The clear way they speak and pronounce the words. I have little experience in French. I found this book very interisting since it presents the french language in a very clear and natural way. It really helped expanding my vocabulary and my listening. For those who are interested in basics of french I surely recommend this book. Since the book has stories narrated in French, it is fun to listen and shows how it would be a conversation in French, which in my opinion is a nice approach when learning a new language. A great thing that helped me a lot is that the book also has a very clear and understandable vocabulary recap which is the translation. It was interesting for me as I had never tried to listen to audio books especially for studying. 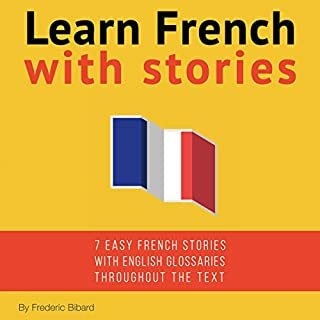 This book is a good way if you want to improve your french. I have studied french at school for almost one year and this really helped me to remind myself some really important basics. Of course, I would listen to it again and again because there is always something new to understand and learn from it!